How many times have you heard the expression; Your Network Is Your Net Worth? So many people go to networking meetings and many of them sit there, quietly petrified, pretending to fiddle with their phones instead of introducing themselves to new connections. And most of the rest do such a bad job of networking that they may as well have gone down the pub. 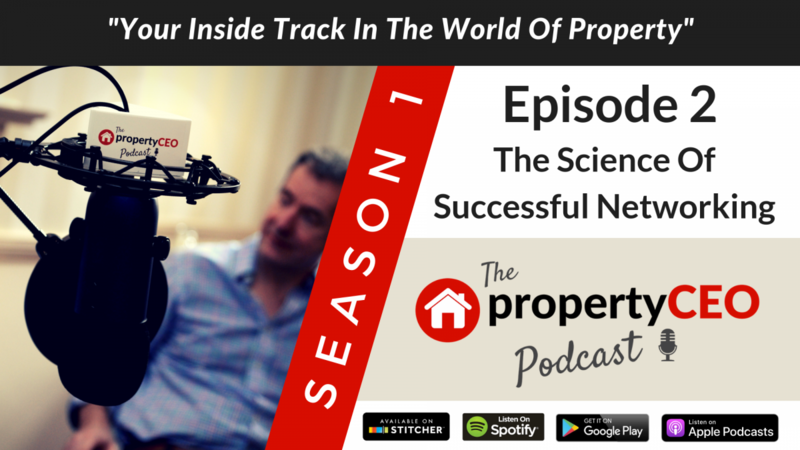 Ian Child from propertyCEO gives a great insight into what can make you a highly successful networker and, contrary to popular belief it’s not something you’re born with – it can be easily learned. In fact it’s definitely a science, not an art. So join us in this episode as we find out the essential toolkit that everyone should have in his or her networking armoury AND we learn the tactics that can make us all networking superstars. For more of propertyCEO, follow us on Facebook @propertyceotraining and on Twitter @Property_CEO, or go to our website www.propertyceo.co.uk. If you enjoyed what you’ve heard, please let us know by liking us and subscribing!